Classic Porro binoculars with a compact, ergonomic body – Bresser National Geographic 8x40 is an ideal travel companion! The model is also a great choice for any sports fan. 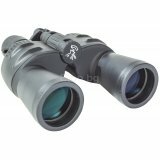 The binoculars are easily adjustable to the user’s individual characteristics and suitable for stationary observations. All optical elements are made of BK-7 glass with full anti-reflective coating. You can regulate interpupillary distance, diopters, and push in eyecups when observing with eyeglasses. The convenient rubberized shell protects the optics from moisture, dust and dirt, and softens blows and falls. The device can be installed on a standard photo tripod.